Riverside Cabins offer fantastic value in a peaceful and convenient location in Thredbo Village. Choose from Studio Loft cabins that are ideal for couples or 1 bedroom plus Loft apartments for families or small groups of friends. Each apartment is fully self-contained, with complete kitchen, lounge room, TV and DVD. 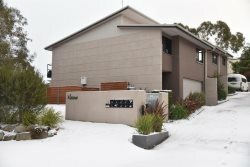 All apartments have views over the Thredbo River towards the mountain. Riverside Cabins have a guest carpark located nearby. The Village Square is an easy, flat 5 to 10 minute walk away and during the ski season the free village shuttle bus service stops right outside the complex. All cutlery and crockery supplied. All linen and towels are provided as well as a small complimentary supply of toiletries. Thredbo has some of the best skiing in Australia and is also a favorite summer holiday spot for couples and families wanting to escape the heat and come to the mountains. There is plenty to do from the obvious skiing and snow sports in Winter and many activities during the summer months. Try fly fishing or take a mountain bike ride or just relax in the Aquatic center. How about a round of golf or tennis? Enjoy the bobsled or take a walk to the top of Australia! Thredbo has many planned events such as the Blues and Jazz Festivals and is the preferred location for State and National interschool mountain bike and snowsports competitions. Some cabins have ladder style staircases which may not be suitable for young children - please advise your guest services officer if you require a cabin without the ladder style stairs. These may be subject to availbility. Sofa beds in cabins are provided with sheets, one pillow and one blanket/doona as these are suitable for one adult OR child only. Should additional linen be required, guests will need to provide their own. A starting supply of amenities is provided on arrival - bathroom soap, toilet paper, dishwashing powder. These supplies are not restocked during your stay.